by Father Jay Scott Newman, J.C.L. In his De Praescriptione Haereticorum, Tertullian famously asked with derision, "What has Athens to do with Jerusalem? ", meaning "What has philosophy to do with theology?" I begin with this reminder because, although I am here to address the Theological Students' Association, I am not a theologian; I am a canon lawyer. And some among you may well ask with derision, "What has canon law to do with theology?" It's a fair question, so before I explore the topic at hand today, I need briefly to digress and establish something of a lingua franca for our discussion. Because she is a human society, the Church has had law, and therefore lawyers, since her foundation, but canon law as a distinct science and course of study did not emerge until the twelfth century. Canonists reckon the Italian monk Gratian as the Pater scientiae canonicae because his work provided a systematic and logical ordering of 1000 years of lawmaking. The Decretum Gratiani, completed around the year 1140, remained an indispensable touchstone for all canonists in the Western Church until the promulgation of the first Code of Canon Law in 1917. Now, you might suppose that after nearly nine centuries of doing this thing called canon law, there would be common agreement among canonists about just what their discipline is. You might suppose so, but you'd be wrong. Among canonists today, there are some fundamental disagreements about the nature and method of their discipline, with two of the major proposals being -- for lack of more precise terms -- legal positivism and juridic theology. I am not here today to describe this disagreement, let alone to resolve the dispute. But to make intelligible much of what will follow in my remarks, I must explain that I hold canon law to be a truly theological discipline and therefore to have a theological method and object. Within the one science of sacred theology we commonly acknowledge many divisions: dogmatic theology, moral theology, biblical theology, and so forth. To these, I submit, must be added juridic theology-that is, canon law understood as a theological discipline with a specifically juridic character, vocabulary, and purpose. "As the Church's principal legislative document founded on the juridical-legislative heritage of revelation and tradition, the Code is to be regarded as an indispensable instrument to ensure order both in individual and in social life ... the Code ... fully corresponds to the nature of the Church, especially as it is proposed by the teaching of the Second Vatican Council.... Indeed, in a certain sense this new Code could be understood as a great effort to translate this same conciliar doctrine and ecclesiology into canonical language." John Paul continues "It follows that what constitutes the substantial newness of the Second Vatican Council, in line with the legislative tradition of the Church, especially in regard to ecclesiology, constitutes likewise the newness of the Code.... If, therefore, the Second Vatican Council has drawn both new and old from the treasury of tradition.... then it is clear that the Code should also reflect the same note of fidelity in newness and of newness in fidelity, and conform itself to this in its own subject matter and in its own particular manner of expression." It is clear, I believe, that the legislator -- the pope -- fully intends the juridic language proper to the Code to be nothing other than a translation of theological doctrine into canonical norms, reflecting most especially the true development of doctrine -- or, as the pope puts it, the substantial newness -- present in the ecclesiology of the Second Vatican Council. Now, with all this in mind, we can turn to our proper topic: communion with the Church by degrees of fullness. One of the great services of the Second Vatican Council is the recovery of the understanding that the one Church of Christ is a koinonia, a true communio -- a genuine fellowship or communion of persons. Moreover, the Council teaches that the Church is a communion of communions; in other words, the communion of the universal Church is a communion of all particular Churches, each of which is a true ecclesial communion of Christians gathered around their bishop. Following this path and striving to find a way to describe the condition of baptized Christians who are not Catholics, the Fathers of the Council began to use, in a variety of forms, a new phrase: full communion. In the conciliar Decree on Ecumenism, for example, the Fathers are describing the fact of disunity among Christians: "In (the) one and only Church of God from its very beginnings there arose certain rifts, which the Apostle strongly censures as damnable. But in subsequent centuries much more serious dissensions appeared and large communities became separated from full communion with the Catholic Church"… (UR, 3). Having acknowledged the fact of disunity, the Council Fathers then describe the theological condition of non-Catholic Christians: "… one cannot charge with the sin of separation those who at present are born into these communities and in them are brought up in the faith of Christ, and the Catholic Church accepts them with respect and affection as brothers. For men who believe in Christ and have been properly baptized are put in some, though imperfect, communion with the Catholic Church" (UR, 3). So, the Council Fathers both acknowledge the fact of disunity and confess that even non-Catholic Christians have real, if imperfect, communion with the one Catholic Church. And then they add one additional refinement: "Without doubt, the differences that exist in varying degrees between them and the Catholic Church -- whether in doctrine and sometimes in discipline, or concerning the structure of the Church -- do indeed create many obstacles ... to full ecclesiastical communion" (UR, 3). In other words, the real but imperfect communion which exists between baptized non-Catholics and the Catholic Church exists by degrees of fullness. To illustrate, we may say that the Orthodox, because they retain a valid episcopate and Eucharist, are -- among non-Catholics Christians -- in the fullest degree of communion with the Catholic Church. Next, perhaps, would come Lutherans and Anglicans, who -- among the children of the Protestant Reformation -- hold the highest doctrines of the Church and her sacraments. The central point here is that communion between a baptized Christian and the one, holy, catholic, and apostolic Church is a reality which exists -- according to differences of doctrine and discipline -- by degrees of fullness. It is here, I believe, that the Second Vatican Council has achieved a genuine development of doctrine in ecclesiology. In the bitter controversies surrounding both the eleventh and sixteenth century schisms, theological and canonical language -- following the notion of the Church as a perfect society -- focused on an individual Christian being either in or out of the Church. To put it crudely: if you were subject to the Pope, you were in; if not, you were out. By recovering the notion of the Church as a communion of communions, Vatican II restored the possibility of seeing one's communion with the Church as a delicate, complex reality which can exist by degrees of fullness. No one validly baptized, in a certain sense, is ever truly out of the Church, although his communion with the Church may be impeded or all but destroyed in a variety of ways -- for example, full communion is impeded or broken by apostasy, heresy, schism, or mortal sin. Here the Council follows the teaching of St. Augustine, "Even though incorporated into the Church, one who does not persevere in charity is not saved. He remains indeed in the bosom of the Church, but 'in body', not 'in heart. '"(LG, 14). But, in addition to following the tradition on this point, the Council also made a genuine innovation. In seeking a way to describe the relationship of non-Catholics to the Church, the Council Fathers also found a new way to describe the often complex relationship of Catholics to their Church. As we saw earlier, Pope John Paul desired that the newness of the Council's ecclesiology should be reflected in the Code and that the Council's doctrine should be translated into canonical language. It is not surprising, therefore, to find canons in the code which take the texts I have quoted from Lumen Gentium and Unitatis Redintegratio almost word for word. First describing all the baptized, whether Catholic or not, Canon 204 says, "The Christian faithful are those who, inasmuch as they have been incorporated in Christ through baptism, have been constituted as the people of God. For this reason, made sharers in their own way in Christ's priestly, prophetic, and royal office, they are called to exercise the mission which God has entrusted to the Church to fulfill in the world, in accord with the condition proper to each." Next, having described all the baptized, Canon 204 continues by describing the Church, "This Church, constituted and organized in this world as a society, subsists in the Catholic Church governed by the successor of Peter and the bishops in communion with him." It is worth noting here the clear echoes in this juridic language of the words of Sacred Scripture from the Acts of the Apostles, "So those who received (Peter's) word were baptized...and they devoted themselves to the apostles' teaching and fellowship, to the breaking of bread and the prayers" (Acts 2:41-42). Thus did St. Luke first describe fullness of communion with the Catholic Church. Once again, as John Paul indicated, what was new in the Council would be new in the Code. Accordingly, there is nothing remotely like Canon 205 in any earlier legislation of the Church, including the Code of Canon Law of 1917. The newness of this canon meant that understanding its true meaning and full consequences would take some time and that interpreting this canon would involve trial and error. Towards the end of lessening the trials and curbing the errors, John Paul II has continued to make clear the intent of the legislator and to explain the correct meaning of the conciliar doctrine on, among other things, communion with the Church by degrees of fullness. The most recent example of this ongoing clarification is Dominus Iesus, which although not a document specifically about ecumenism, does help us understand more fully the ecclesiological consequences of the Church's faith that there is but one Lord, one faith, one baptism. More to the point for us today, however, are two other clarifications which shed light on the meaning and consequences of Canon 205. In the 1983 Code, Canon 833 provides a list of persons required to make a profession of faith according to the formula approved by the Apostolic See. All who become participants in a ecumenical or particular council, or in a synod of bishops or a diocesan synod must make this profession of faith. All who become diocesan bishops or a member of the College of Cardinals must make this profession of faith. All who become vicars general, judicial, or episcopal must make this profession faith. All who become parish pastors, seminary rectors or professors, and all who are to be ordained deacon must make this profession of faith. All who become rector of a Catholic university or who teach disciplines involving faith or morals in any sort of university must make this profession of faith. In short, anyone and everyone charged with teaching the Gospel in the Church's name must make this profession of faith. The Code, however, does not provide the text for this profession of faith, and it was six years after the promulgation of the Code that the new formula was finally given. The text of the profession is simple: it begins with the Symbol of Faith, and after the words of the Creed are added three short paragraphs, each corresponding to a different level of teaching and the nature of the assent demanded. The first of these paragraphs states: "With firm faith I also believe everything contained in God's word, written or handed down in tradition and proposed by the Church, whether by way of solemn judgement or through the ordinary and universal magisterium, as divinely revealed and calling for faith." The next paragraph describes a different sort of teaching and acceptance: "I also firmly accept and hold each and everything that is proposed definitively by the Church regarding teaching on faith and morals." Finally, the last paragraph describes yet a third level of doctrine and response: "Moreover, I adhere with religious submission of will and intellect to the teachings which either the Roman Pontiff or the College of Bishops enunciate when they exercise the authentic magisterium, even if they proclaim those teachings by an act that is not definitive." When the profession of faith was promulgated in 1989, these three paragraphs elicited howls of outrage from many in the theological and canonical guilds, but these words are nothing more or less than a juridic translation of the teaching of Lumen Gentium on the nature of teaching authority in the Church and the response called for from the faithful. (cf. LG, 25). In other words, the Profession of Faith does precisely what the pope said in 1983 all legislation should do: translate conciliar doctrine into canonical norms for the right ordering of the Church's life. "To protect the Catholic faith against errors arising on the part of some of the Christian faithful, in particular among those who studiously dedicate themselves to the discipline of sacred theology, it appeared highly necessary to us, whose special task is to confirm the brethren in faith, to add new norms to the text of the Code of Canon Law.... The purpose of the new norms is to impose expressly the duty to preserve the truths proposed definitively by the magisterium of the Church and to institute canonical sanctions concerning the same matter." John Paul then goes on to explain that the promulgation of the Profession of Faith in 1989 left a gap in the Code of Canon Law of 1983 and that he decided to close that gap. Specifically, Canon 750 in the original '83 Code -- contained in Book III on the Teaching Office of the Church -- described in juridic language the obligation of the faithful to believe with divine and Catholic faith all those things contained in the deposit of faith. Moreover, Canon 752 described the duty to give religious submission of intellect and will even to doctrines which are not proposed as definitive. These two canons, then, corresponded to the first and third paragraphs which follow the Creed in the Profession of Faith. As John Paul points out in Ad Tuendam Fidem, however, the Profession of Faith distinguishes not two, but three, levels of teaching, and one was missing from the original 1983 Code. Accordingly, he added a second section to Canon 750 which now reads, "Each and every thing which is proposed definitively by the magisterium of the Church concerning the doctrine of faith and morals, that is, each and every thing which is required to safeguard reverently and to expound faithfully the same deposit of faith, is also to be firmly embraced and retained; therefore, one who rejects those propositions which are to be held definitively is opposed to the doctrine of the Catholic Church." As with the Profession of Faith nine years earlier, this Apostolic Letter raised the hackles of some in the theological and canonical guilds, and yet in both cases, John Paul was merely continuing the process of refining the Church's understanding of a new thing: the idea of communion with the Church by degrees of fullness. Let's return to Canon 205: "Those baptized are fully in the communion of the Catholic Church on this earth who are joined with Christ in its visible structure by the bonds of the profession of faith, the sacraments, and ecclesiastical governance." Three essential elements for full communion are laid out: the profession of faith, the celebration of all the sacraments, and adherence to the authority of the Pope and the bishops in communion with him. Precisely because this canon was a new thing, however, it was not self-evident what all of this meant. Moreover, while Canon 205 describes what constitutes full communion, it does not describe how such fullness is effected, and neither does it explain how full communion might be compromised. Because of these ambiguities in the law before the clarification offered by the Profession of Faith and Ad Tuendam Fidem, even able and respected canonists misinterpreted part of the novelty of this development. For example, in his commentary on Canon 205 published in 1985, the estimable James Provost wrote: "Heresy, the obstinate denial or doubt of a teaching that is to be held with divine and catholic faith, requires pertinacity in addition to denial or doubt (c. 751). Heresy does not apply to doubt or even denial of other types of church teaching, which presumably would not break the bond of full communion." (p. 127; emphasis added). About one thing Father Provost was absolutely correct: heresy is technically only the obstinate denial or doubt of a doctrine which must be believed with divine and Catholic faith -- that is, the level of teaching corresponding to the first paragraph added to the Creed in the Profession of Faith. But fifteen years after Father Provost wrote those words, Pope John Paul closed the gap in the Code and clarified exactly this point. The Code now contains a section corresponding to the second paragraph of the Profession of Faith, and it is here that all of our strands come together. This bears repeating carefully: In light of the teaching of Lumen Gentium as clarified by the Profession of Faith and Ad Tuendam Fidem, it is now clear that as a juridic norm based on Canons 205 and 750 of the Code of Canon Law, a Catholic who rejects a doctrine which must be definitively held is no longer in full communion with the Catholic Church. Great precision of language is needed here. As Father Provost correctly insisted, rejecting a doctrine which must be definitively held (as opposed to one which must be accepted with divine and Catholic faith) does not make one a heretic. But contrary to the early interpretation of the law, rejecting a doctrine which must be definitively held does break the bond of full communion. Now, you may well ask, what are some of those doctrines. In his commentary, Cardinal Ratzinger lists a few: that only baptized men may validly receive priestly ordination; that euthanasia is intrinsically immoral; that prostitution and fornication are immoral; that a Pope once legitimately elected is, in fact, the supreme pastor of the universal Church; that canonized saints do, in fact, enjoy the beatific vision; and that Anglican orders are absolutely null and utterly void. Within this list of examples there are truths connected to divine revelation by logical necessity, by historical necessity, or by dogmatic fact. But despite the differences in the kinds of connection to divine revelation, all of these teachings must be accepted with full and irrevocable assent; they are doctrines de fide tenenda and to reject such a doctrine is to break the bond of full communion. What does all of this mean? Well, at this point, that isn't clear. Remember that it has taken 35 years to move from the conciliar documents to the understanding of their consequences now given in the pope's teaching and the law of the Church. But, whatever may still be in doubt, it is now clear that the law provides for consequences for rejecting a doctrine which must be definitively held. In addition to adding a second section to Canon 750, Ad Tuendam Fidem also added a section to Canon 1371 in Book VI of the Code, on Sanctions in the Church. Canon 1371 now says that anyone who rejects a doctrine which must be definitively held and who does not retract after having been warned either by the Apostolic See or by his Ordinary is to be punished with a just penalty. In other words, breaking the bond of full communion -- by, for example, teaching that women can receive priestly ordination -- has juridic consequences. Exactly what those consequences are is not spelled out in the law, and it is clear that more time will be needed before clarity emerges on the prudent, just, and charitable response of the Church's pastors to such situations. But that there must be consequences is now indisputable, because what is at stake is nothing other than full communion with the Church. In the sometimes unruly disputes of the past 35 years, the claim has often been advanced -- sometimes crudely, sometimes with refinement -- that is possible to dissent, that is, to disagree with the Church about the doctrine of the faith and yet remain, as it were, a Catholic in good standing. With the increasing clarity gathered from theological and canonical reflection on the idea of communion with the Church by degrees of fullness, it is now apparent that this claim is false. Ideas do have consequences. Refusing to believe a doctrine which must be definitively held does not, it is true, make a Catholic a heretic, but it does render his communion with the Church less than full. And such a theological reality must have canonical consequences, especially if the person in question holds an ecclesiastical office or teaches in the name of the Church. Here we must tread lightly. No one is advocating a witch hunt; neither can we tolerate a hypercritical spirit of which would attack even legitimate diversity. And when a Catholic does have difficulty accepting a doctrine which must be definitively held, we must be kind, gentle, and patient; after all, St. Paul exhorts us to bear the burdens of those whose faith is weak. Nevertheless, fidelity to the Gospel -- even, as the pope put it, fidelity in newness -- demands that we be honest about the consequences of our beliefs and acknowledge the effect they have on our communion with the Church. And because of a genuine development of doctrine from the Second Vatican Council we now have the conceptual apparatus--in the newness of fidelity -- to express with precision the theological and canonical consequences for a Catholic of rejecting a doctrine of the faith which must be definitively held. 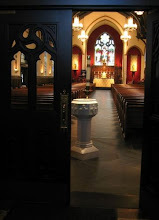 Just as we now understand that it is possible for Orthodox and Protestant Christians to approach communion with the Church by degrees of fullness, so we must now grasp that it is equally possible for Catholic Christians to depart from communion with the Church by degrees of fullness and that such departure must have canonical consequences. Expanding on the precept of St. Augustine that a unless he persevere in charity a Catholic can remain bound to the Church in body but not in heart, I wonder if it is not now possible to describe circumstances in which some non-Catholic Christians have a greater degree of fullness of communion with the one Church of Christ than do some Catholic Christians because of their stubborn refusal to believe doctrines of the faith which must be definitively held. I suspect that such a prospect is a logical consequence of the substantial newness of ecclesiology in Vatican II -- namely, that one is not either in or out of the Church, but rather that all the baptized are joined in real communion with the Church by some degree of fullness. In other words, it is now clear that the road of communion with the Catholic Church by degrees of fullness is a two-way street.